The great composer Giuseppe Verdi (1813-1901) had a long prolific life. From “The Chorus of the Hebrew Slaves” from his first success Nabucco in 1842 to Falstaff in 1893, his work consisted of 28 or so operas that captivated the opera world and still do. Verdi’s Aida is a miracle work and a true sample of “Grand Opera.” It remains like the classic film Casablanca basically the story of three people subject to circumstances that they are powerless to resist. Radames, Aida, and Amneris are the protagonists. The premiere of Aida was on December 24, 1871, in Cairo, Egypt. The Italian premiere at La Scala in Milan was a few weeks later. On November 26, 1873, Aida was performed at the Academy of Music in New York. The libretto was written by Antonio Ghislanzoni although Verdi said the libretto was the product of “my work.” Verdi was 57 when he composed Aida which was his 26th opera. It hints of Meyerbeer in its grandeur but its human story is what keeps it fresh and popular and who could resist its world-famous Grand March? Ramfis (Kofi Hayford) Amneris (Galina Ivannikova Maestro Ida Angland & Aida (Kimberly Lloyd). The Gateway Classical Music Society was founded by Maestro Ida Angland in 2003 and it has grown to great acclaim. The Gateway Orchestra is comprised of outstanding musicians from the tri-state area. 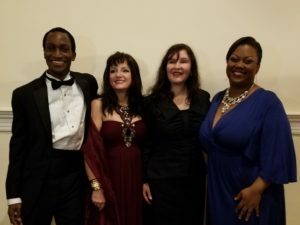 The orchestra’s performances have been extolled by numerous publications in New York and Connecticut. This production of Aida was at the Good Shepherd Faith- Presbyterian Church, in the Lincoln Center area on Sunday, November 11th thanks to sponsor, John Gingrich. Gateway’s 2018 performance of Verdi’s Aida was dedicated to the late Franklin Brownell Manley (1929-2017) beloved founding patron and advisor. Maestro Ida Angland was the Music Director and Conductor and Roberto Stivanello of the renowned Stivanello Costume Company was the Stage and Lighting Director. 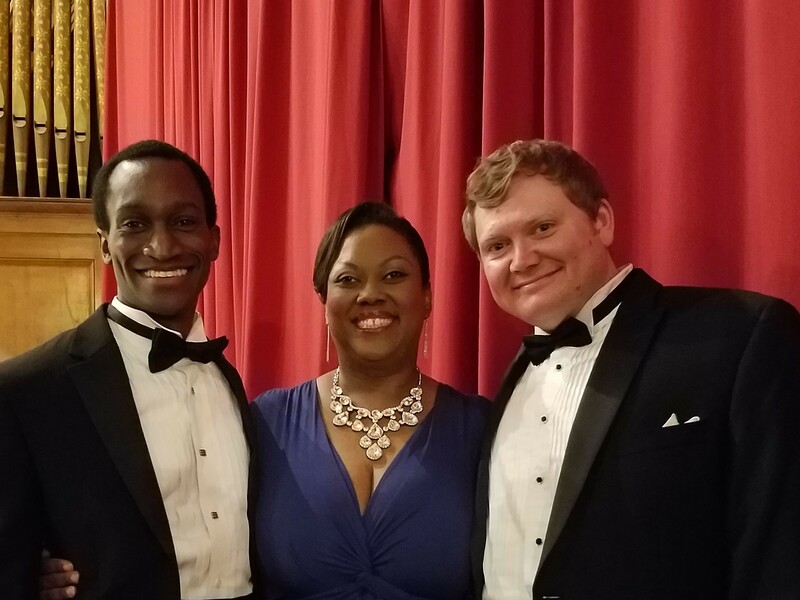 The magnificent gowns worn by Aida and Amneris were regal and impressive as were the tuxedo-clad gentlemen singers. The huge orchestra of over 70 musicians was ready as Maestro Angland stepped to the podium. After a moment or two of silence, Maestro Angland lifted her baton and the beautiful music began, quietly, reached a few peaks and ended with peace. Gregory Geis was Radames and his lyrico spinto tenor ravishingly negotiated the paths of the iconic “Celeste Aida.” His vocal delivery was to tighten the voice, then release it, swelling powerfully. In the MGM film, 1948 Luxury Liner the great Danish heldentenor Lauritz Melchior sang the Act 3 finale duet with soprano Marina Koshetz using the same technique. Melchior made four mega-hit films for MGM and later one for Paramount. His magnificent voice, six foot four height and white hair made him a true star of the silver screen. Mr. Geis sang a beautiful “Celeste Aida” ending it with a full voice, “Vicino al sol.” Mr. Geis evoked the golden age of tenors on the old phonograph with his full middle voice and strong upper reaches of his instrument. I saw Melchior in Guy Lombardo’s Arabian Nights at the Marine Theatre in Jones Beach in 1955. He sang “A long Ago Love” in beautiful fresh voice at age 65. The immortal tenor Enrico Caruso was Radames in Aida with the Metropolitan Opera on tour at the Brooklyn Academy of Music on January 17, 1909. The conductor was the iconic Arturo Toscanini. Caruso’s 1911 recording shows him belting out the final “Vicino al sol” in full golden voice. Verdi might have preferred it be hit softly but I am a Caruso devotee and I much prefer it as Geis and Caruso chose to sing it! I enjoyed Mr. Geis’s “Mortal diletto ai Numi-“Nume custode e vindice” followed by a powerful drum rolling “Immenso Ptah” sung with Ramfis. His scene with Amneris, “Gia i sacerdoti adunansi” was passionately done. At the finale of Act Three his “Sacerdote, io resto a te” was exhilarating. “La fatale pietra” was sung with fateful utterance and ample lyrics and his final “O terra addio” in the tomb had heavenly highs and one felt that his voice and ascending spirit were one. A truly stellar performance. Kimberly Lloyd was an Aida to remember. Her “Ritorna vincitor” revealed a beautiful soprano with reserve and staying power. Her confrontational scenes with Amneris always evoked sympathy and her singing of “O patria mia!” was exemplary. Her acting and powerhouse singing with her father Amonasro was indelible. Her upper reaches were seemingly unstoppable, her closing dramatic utterances remarkable and her floating notes ethereal. Ms. Lloyd’s singing in the final act was heartfelt and her blending with Radames in “O terra, addio” was purity itself. An outstanding performance. Because of Amneris’s great dramatic music and fierce persona, some thought that the opera should have been called Amneris. This is partially true and a great Amneris coupled with a weak Aida can steal the show. However, with “equal billing” you get “The show of Shows” as Amneris, Galina Ivannikova was superb. Like Santuzza in Cavalleria Rusticana she literally kills her ex-lover by “snitching.” Hers is a different scenario. Amneris’s lover Radames is on the cusp of reigning with Amneris his bride to be, but Amneris senses his love for the slave girl Aida. Amneris has a change of heart when Radames is condemned to death. Her passions, fears and the collapse of her dreams make Amneris a snake with venom who was forced to do so. She lives on but loses everything she really wanted to Aida. Galina Ivannikova’s scene with Radames, “Gia i Sacerdoti Adunansi-Misero appien mi festi,” in Act 4 was sung with the most emotional passion. Caruso’s 1910 recording of this with American mezzo Louise Homer bears listening – such intensity. Ms. Ivannikova’s scenes with Aida were properly spiteful and with Radames seething and despondent but in the Act Four Judgement scene “A lui vivo, la tomba!” was sung powerfully, ending with “Empia Razza! Anatemo su voi! La vendetta del ciel” which left us virtually gasping for air! Such magnificent singing, such emoting, such despair! Ms. Ivannikova’s sumptuous mezzo soprano with its passionate top burnished lows trembling mood left the audience like sinners at a Billy Graham rally – transfixed, stunned and rhapsodic! Alexander Boyd was Amonasro, the King, father to Aida. My very first opera at the Met was as a standee on March 8, 1952. The cast was the great tenor Mario Del Monaco as Radames, legendary soprano Zinka Milanov as Aida and blessed and sacred Bronx born Leonard Warren as Amonasro. All three were unforgettable. The strong Amneris I believe was Nell Rankin. Warren’s singing of “Ma tu, Re, tu signore possente” in Act Two was stupendous. I never heard such a magnificent baritone. Del Monaco and Milanov had voices you remember and vividly relive. Alexander Boyd as Amonasro possessed a strong baritone with some wonderful high notes with a round secure middle and very congenial lows. In Act Two, he did a beautiful job and his voice was dynamic and lyrical especially in “Ma tu re, tu sognore possente”. In the third act, his “Tu sei la Schiava” rocked the house with its power and volatility in one of opera’s most dramatic scenes. This scene with his daughter Aida made her choice inevitable. Ramfis, the High Priest was sung by Kofi Hayford. The “Immenso Ptah duet” was quite exciting with Radames’ golden tenor and Hayford’s deep dark bass joining forces of light and dark to offer sacred power. A magnificent recording of this duet “Numi custode e vindici” exists in the RCA Victor catalog or on the internet with the unforgettable basso born in Rome, Italy, Ezio Pinza and the famed Metropolitan Opera tenor Giovanni Martinelli (1885-1969). Ezio Pinza, (1892-1957) great star of the Metropolitan Opera and Broadway’s South Pacific is buried near Greenwich, Ct. where he lived. I am certain Pinza would be gratified to hear such a splendid Ramfis and Martinelli, such a splendid Radames as we did this magical performance. Heather Bobeck was the High Priestess. Her soprano was angelic in its purity and made a strong impression on the audience. Dorian Balis was the clarion-voiced Messenger and made one sit up and take notice of the heroic aspects of his strong tenor. The finale of Aida with the lovers onstage in front and Amneris evoking “Pace, Pace” wishing for peace, ends this monumental work on a quiet, peaceful and beautiful note. All the triumphs, passions and tragedies end with death with the one you love for eternity. Maestro Ida Angland’s conducting from memory without a score like the iconic Toscanini, of this incredible masterpiece by Italy’s greatest composer was sublime. Watching her use the baton made me realize how Aida and Verdi transformed her into a great interpreter. I saw and heard the great predecessors that made Ida Angland what she is today but she broke out of the skins of the past and gave us an Aida to remember forever. The Grand March and Meyerbeerian influences were thrilling but all the ingenious things that make Aida so unique were brought out by Maestro Ida Angland, the very gifted singers, the heavenly chorus, the exciting dances, and the superb Gateway Orchestra. The great singing and acting taking place center aisle gave us all proximity to the performance. The chorus was excellent, especially in the “Immenso Ptah” and “O terra addio” scenes. Maestro Angland’s chorus experience as a choral director with the New York Grand Opera under her mentor the late Maestro Vincent La Selva and as a soprano soloist elsewhere (WQXR radio) always assure superb performances. It was nice to greet the former concertmaster the elegant and affable superb violinist Gino Sambuco and “good will” chorus members who are longtime dear friends, Josef Fedor, and Robert Malfi. Roberto Stivanello who did the lighting and wondrous costumes for this concert version was happy to see everything go so gloriously. Roberto, our best to your wonderful Mom Yolanda. Hannah Murphy’s accompaniment on the harp was beneficial. It was a great joy to chat with Maestro Angland and the cast. Caracalla in Rome, The Metropolitan Opera in New York and the arena in Verona, Italy had their inner ear on New York City. This was an Aida that in its perfection makes us all better and closer to the ideal. Being “up close and personal” to Giuseppe Verdi is reaching the ideal. The glories and memories will live in our hearts forever. Brava Maestro Ida Angland! Bravo Gateway! Bravo Verdi! Thank you for your kind response to my review of Aida by Gateway. Yes, we know Semyon, a very fine musician and conductor and a good friend of my son Marcello and his wife Tanya. Connie Chen, another friend, is also a strong supporter of the Amore Opera. 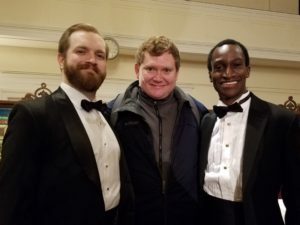 We also are familiar with the Amore Opera and reviewed a splendid special performance honoring the late beloved Anthony Amato several years ago when he was alive and well. I am not as young as I was then and can’t get around as rapidly as I used to, but perhaps after the holidays we can arrange something. I wish you all a wonderful Holiday season and thank you on behalf of the renewed vigor you offer the world of opera as we approach 2019! Thank you Nino for telling us about this wonderful performance, reminding us about the great Verdi interpreters of the past and thanking him for his “Aida”! I’m not sure how to contact you, but the High-priestess that evening was Heather Bobeck not Virginia. Thank you for the warm review!